Planting whitetail food plots has become one of the hottest topics when talking about deer management. It's hard to find a hunting show or deerhunting website that doesn't touch on food plotting. With all the hype, the average hunter would think that planting food plots is the most important part of managing white-tailed deer. However, food is only one component of deer management. Food is a critical element in the management equation, but no more so than water, cover, ample space and balanced combination of them all. The over abundance of anyone of these components is useless if the others are lacking. 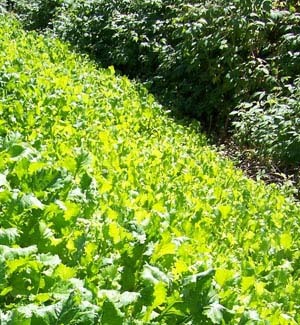 What Is A Food Plot? Food plots are defined as agricultural-type crops planted for wildlife to supplement nutrition provided by native vegetation. Food plots reduce browsing pressure on native plants and allow for brouse regeneration when proper deer numbers are maintained. High nutritional values of food plots can have a huge impact during winter when native foods are limited in both quantity and quality. What many novice food plotters should know is that it is best to address the whitetail deer food issue by first looking at how to enhance the plant communities that already exist in a particular habitat. Supplementing deer nutrition should only be considered after you have already taken steps and are satisfied that you have done all you can with the native available food sources on your property. Good deer management means maintaining diverse native plant communities. Then, depending on the your management goals, you can look at food plots to supplement deer nutrition. Soil - The soil should have the capacity to grow what is planted. Wet, rocky, shallow soils are not good for most food plots. Slope - Anything greater than five percent can cause erosion from the tilling of the soil. Fertilizing - Soil samples are the only way to determine the proper fertilizer needed. Fertilizing a food plot increases forage production, and nutritional value, making it more attractive to deer. Size - In areas with high deer densities, smaller food plots may be quickly consumed by deer, not allowing the food plot to meet its intended use. Nutritional plots are typically 1-5 acres.